Our ISO 15765 Protocol Stack provides a simple application program interface (API) for sending and receiving ISO 15765 messages over a CAN network. It supports boths 29-bit and 11-bit CAN identifiers and ISO 15765-2, ISO 15765-3, ISO 15765-4, OBD-2, EOBD, UDS, and KWP2000. It has been validated to withstand 100% bus utilization on multiple networks simultaneously. 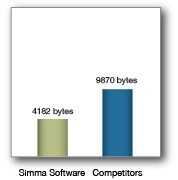 Our ISO 15765 protocol stack was designed by Simma Software, the CAN experts, and has been used in more than a million ECUs. The protocol stack abstracts away the technical details and complexity associated with encoding and decoding of ISO 15765 messages. Our source code increases the simplicity of your application software, improves your reliability, and shortens your product's time to market. All software packages include well documented source code and a complete user's manual. If you have questions about our ISO 15765 software, please see our ISO 15765 FAQ for possible answers. This article is intended to give engineers a brief overview of the ISO 15765 protocol. For details on the specification itself, please visit the International Organization for Standardization (ISO). ISO 15765 is physical layer, datalink layer, and transport protocol for OBD-2, EOBD, UDS, and KWP2000. It is used it is reqired in all passenger cars and is used world wide. 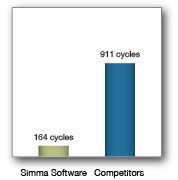 As of 2008, ISO 15765 replaces both versions of SAE J1850 and ISO 9141. ISO 15765 is a low level communications protocol, which operates on a Controller Area Network (CAN) bus. ISO 15765 specifies exactly how messages are exchanged between electronic control units (ECUs) on a vehicle. It defines a messages's priority, source address, destination address, size, and how large messages are fragmented and reassembled. For example, ISO 15765-4 specifies the engine to be address 0. At the heart of ISO 15765 is the Protocol Data Unit (PDU), which is a number assigned to every type of frame. The PDU serves to identify single frames, first frames, consecutive frames, and flow cotrol frames. A message will be consist of single or multiple frames, and it is the PDU which encodes that information. SF PDU stands for single frame PDU and is used when a message is sent out as a single frame. This is the most simple form of encoding used in ISO 15765. Message lengths of 1 to 7 bytes will use the single frame PDU. FF PDU stands for first frame PDU and is used when a message is sent out as a multiple frame. This is the first frame sent in the exchange between nodes. Message lengths of 8 to 4095 bytes will use the FF, CF, and FC PDUs. CF PDU stands for consecutive frame PDU and is used when a message is sent out as a multiple frame. This is the frame sent repeated in the exchange between nodes and contains the actual data for the complete message. Our real-time ISO 15765 protocol stack is completely platform independent and written in the ANSI C programming language. It is the CAN device driver, ssCAN, that is target specific and incorporates the details for a given microcontroller. Together ssI15765 and ssCAN form a complete ported system allowing customers to be up and running almost immediately. Our ssCAN device driver has been ported to over 40 different microcontrollers. Below is the list of available ports. Please contact us if you are interested in a port or device driver for a hardware platform that is not listed.